Fiber supplements are an easy way to add more fiber to your diet. However, not every supplement is the same. When it comes to fiber gummies, they not only add fiber to your diet which helps with bowel movement but also helps you lose weight and curb your appetitive. By turning into a soft gel inside your digestive tract, fiber gummies can help you battle your appetite. Numerous individuals have achieved their weight loss goals with the help of fiber gummies. They will say that fiber gummies are certainly worth it. However, remember that you need to stick to your weight loss diet and exercise regularly in order to lose weight. Do you like eating delicious meals but also want to shed some pounds? Losing body fat is all about creating a caloric deficit which means almost certainly you will be hungry all the time. Fortunately, now you can support your diet by savoring remarkable, natural appetite suppressing, Skinny Piggies! 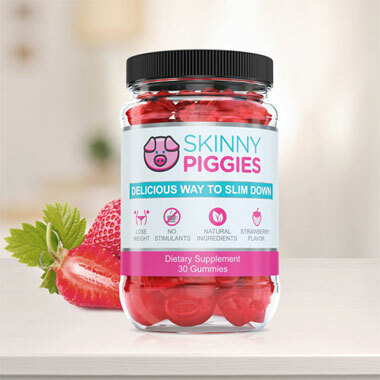 Skinny Piggies are remarkable fruit flavored gummies that help you avoid sweet cravings and the desire for food while allowing your body to remain in weight loss mode. Before we talk about Skinny Piggies fiber gummies, let's understand what is required for your body to start shedding fat. 2) A diet that's fun enough that you can stick with it for a long period of time. Sad to say, many diet plans miss one (or all three) of these items. To be able to see great success with your program, it's critical that you consume less calories than your body burns each day. You could do that in one of two ways: boost your caloric output through added workouts or minimize your food consumption. Doing both of these is best! If only weight loss were that easy. Even though cutting back on your daily calories seems easy, in real life your carbs cravings are likely to keep you dreaming about sugar snack the whole day. You don't need to give into sugar binges. 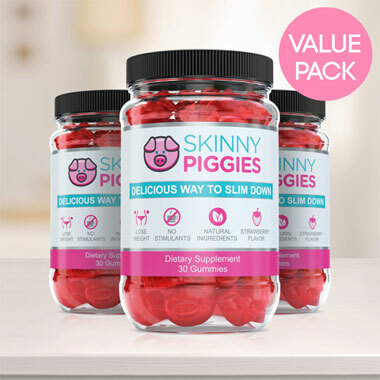 Skinny Piggies are delicious fiber gummies that naturally help curb your appetite, meaning that your cravings will be soothed without you cheating on your weight loss diet. The concept is pretty simple. Appetite is caused by two key things: the number of calories you eat and the presence of food in the stomach. After a meal, your stomach expands in size by the food pressing against the sides, that makes you feeling full and no longer hungry. When you start taking Skinny Piggies before eating lunch or dinner, you will feel fuller. Chewing a Skinny Piggy with a big glass of water about a half hour preceding eating dinner will cause it to expand in your stomach so that it takes up space and makes you feel you just ate a large meal. This way you can reduce appetite and keep eating less, all without seeming like you're eating less than before. The gel enables your stomach to empty much slower leaving you satisfied much longer. The longer you are satisfied, the less likely you will continue to eat which lets you to achieve a reduced calorie intake. As the soft gel surrounds the food, it delays the digestion of sugars which in turn flattens your level of blood sugar. By avoiding quick changes in your blood glucose you prevent those unbearable cravings. When you prevent blood glucose spikes by slowing down the absorption of sugars you are preventing it from being stored as unwanted body fat and that then sets off the body to burn off its stored fat. The slower the digestion the longer your body achieves fat burning mode. How do Skinny Piggies Measure up against other Fat-Loss Pills? You may be asking, what is different about Skinny Piggies weight loss gummies versus some of the other fat loss natural products on the market? Skinny Piggies contains zero artificial additives. Take a look at your average fat burner and you'll see a whole line-up of chemicals. 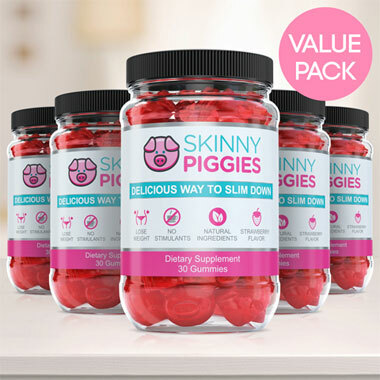 Amazing Flavor: Very few fat loss supplements actually taste good, and almost none have the great tasting taste of strawberry gummies, and that means Skinny Piggies are a pre-meal treat you will look forward to. No Harsh Chemicals and Stimulants: Taking a weight loss supplement without harsh stimulants means that you may take them even at night. Wholesome Nutrients: On top of helping you slim down, they also support the growth of stronger hair and nails and help your skin look younger. Genuine Ingredients: Unlike other fat loss pills, it's actually easy to pronounce every ingredient in Skinny Piggy diet gummy supplements, knowing that you're filling your body with the best ingredients. Losing body fat is hard, but our product is here to help you make the process a bit easier. You'll love the refreshing flavor of our fiber gummies, so remembering to eat your diet supplement every day won't be a problem. Skinny Piggies are dietary supplements that can help anyone.